Formed by Giuliano Obici and Alexandre Fenerich in 2007, the duo N Minus One (n-1) explores several processes of sound. N-1 came from sound experimentation, from "gambioluthiery" - creation of craft instruments, adaptations and appropriation of sound materials other than everyday life - and improvisation. Navigating the terrain of real time image manipulation, the duo brings with it experimentations and experiences from the sonorous to the performance without losing its speculative character. More information: www.n-1.art.br. Surfing on Turntables is an audio-visual piece for 4 phonographs, 4 video cameras, 4 four discs prepared from Mahler's First Symphony and scenes from the Alfred Hichckok's film The Man Who Knew too Much. 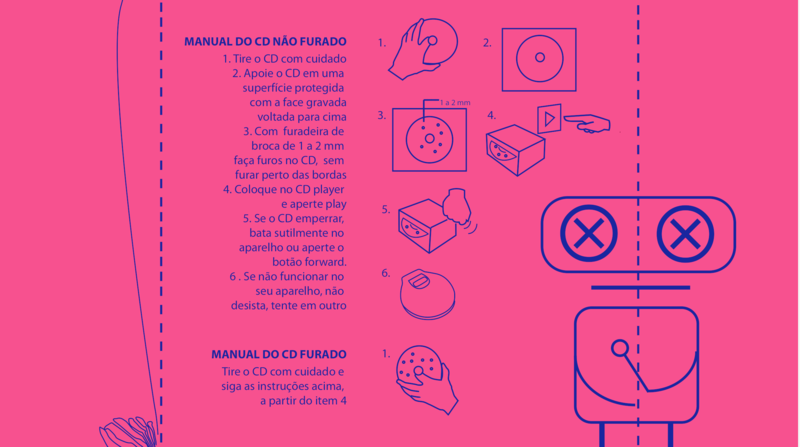 Each disc was prepared with small objects (tapes, buttons, screws, rings, rings) fixed at different positions of vinyl's surface. It results interferences in the recorded material. The musical piece emphasizes the sound peculiarities (texture, rotation, needle friction, noise, grain) characteristics of the different models of portable recorder. 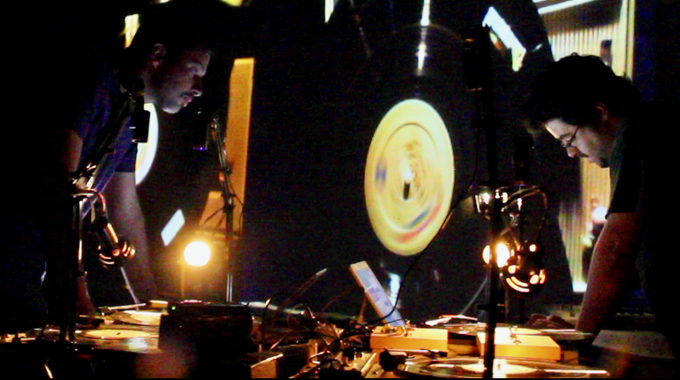 In the live version, the musicians' gestures manipulating the vinyls are captured by cameras on positioned up each turntable. Along with the live images are inserted scenes extracted from the film of Hitchkock, in particular the scene of a murder covered by the orchestral tutti. The piece follows a score that plays with three distinct apices: 1) climax of Hitchkock's film with the shot that would kill the ambassador, 2) climax in the Mahler symphony with the orchestral tutti of the first movement coinciding with the tonal tension and density of the symphonic, and 3) the climax given by the musicians in performance. The piece ends when the three apices merge, then dissolve into a static repeated scene.